The artist named the artwork "The Rose of Marya: Service through Excellence". Marya is the Philipinized version of the name "Maria", the Latinate form of Mary. Many believe that the name Mary means "sea of bitterness". A woman, through childbirth and motherhood is biologically and sociologically destined to endure sacrifices in her role as life-giver and nurturer. Maria as a name, despite its pessimistic meaning, has evolved in history to be a name of honor, because it is the name of the Virgin Mother of Christ, the epitome of faith, courage and purity, who endured countless sufferings to fulfill a purposety higher than herself. The name maria is the most common name given to women in Philippine society. The artist believes that the name Marya, is a fitting name to bestow on an icon sculpture that will represent each woman who desires, pursues and achieves excellence for the good of humanity and, in so doing, purifies herself towards holistic perfection. The artist presented the concept in a universal and charismatic manner which spectators can easily understand and emphatize with. The goal of the design is not only to give tribute to the women of UPLB who excel and serve but also to inspire and compel the spectators to follow their example - that is to achieve excellence and through excellence serve the community and humanity as a whole. The color was treated to simulate old ivory with dark sepia undertomes to give off a sense of strength and eternity - that like the noble idea that it promotes, the sculpture is not new. It has always been there. it is from the earth and of the earth, but has lofty and metaphysical origins and all-encompassing purpose. 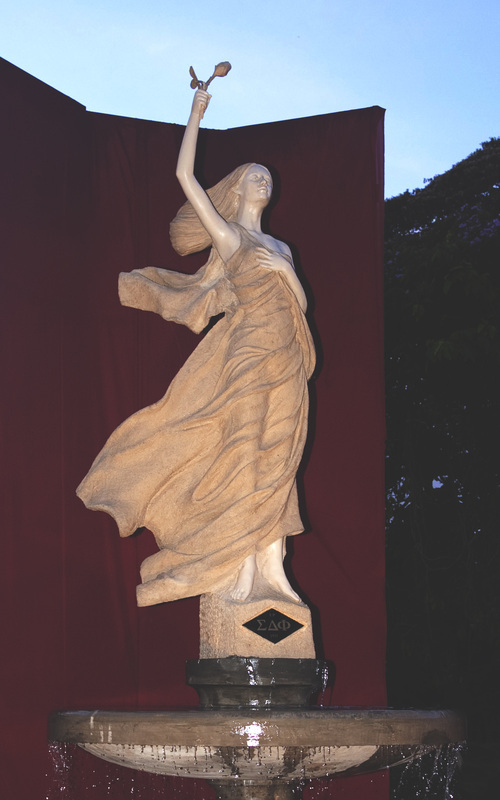 The sculpture was rendered as a woman standing in triumphant stance. This symbolizes women's victory over the struggles that they encounter in their life's pursuit of excellence. She is also cognizant and confident of her own completeness and worthiness as a servant-leader of humanity. Marya's right arm is upraised clutching a rose triumphantly. the rose has many and most profound meanings in the symbolism of universal mythology. By virtue of its shape, color and scent, the rose is an omnipresent representation of excellence and perfection. The Rose of Marya was sculpted with thorns to represent the struggles and sacrifices that a woman faces and overcomes in her quest for perfection. Marya is victorious because her mind, body and spirit are able to prevail over all adversities and hardships. Her spirit is purified by all pain and ordeal. She has succeeded to transcend herself from the pain of struggles and emerges as the bearer of and bringer of perfection in both mind and spirit. Marya's left hand is at her breast as an expression of her desire to give all of herself to humanity. Placing the hand to the heart is the supreme outward expression of fealty and giving of oneself. Marya recognizes her oneness with all of humanity and desires to offer herself and all her capabilities to its service. Marya's eyes are half-closed and her lips were curved to a smile to emphasize her tranquil surrender, satisfaction and bliss as she presents herself to the world - a capable and evolved being, purified and made perfect by the trials and challenges she faced and overcame in her pursuit of excellence. Excerpt from "The Concept of Marya"
"...what a clever display of seductive image and form. The supple figure and the tactful feature of your work recall earlier Roccoco, with its charm and realism despi...te its firmly neoclassical approach. The purity of contours in your work displays a subtle and discrete eroticism. it is an absolute champion of idealization. Antonio Canova, John Flaxman and Bertel Thorvaldsen are preeminently felt in this work." Maria Pureza Escaño's Thanksgiving Statement during the Unveiling of "The Rose of Marya"
May God be glorified through this work of my hands for it was His grace which has brought about its creation. I am merely a channel through which His creativity manifests itself. The woman artist has come a long way from the time of Virginia Woolf, a time when she was always forced to stand at the sidelights, to ache forever for the birthings of creativity that more often than not die from the glare of prejudice. As the world began to emancipate women artists, proudly, the Filipina artists kept in stride. And the global Filipina artist was born. Today, this Filipina artist joins the novelist Isak Dineson who said that "Through all the world, there goes one long cry from the heart and soul of the artist: Give me leave to do my utmost." My friends, people of the University of the Philippines Los Banos, the beautiful minds behind the Sigma Delta Phi, it is with deep gratitude that I shall today say to all of you, thank you from the bottom of my heart for empowering me to do my utmost. Thank you for honoring me with your faith. Thank you because, through your empowerment this Filipina artist now does not only write and paint, she has also accessed the male-dominated discipline of sculpture. Many years ago, I took and passed the entrance exams to this University. But I was heartbroken when my folks did not allow me to study here. But our God is a loving God and He truly works in mysterious ways, His wonders to behold. For beginning today, my work will stand in the august soil of this university for all eternity. I praise and thank God for my dear husband Rad and my friend Engineer Tony Suiza, without whose help, I would have been still suffering from endless creative deaths. I also thank a dearest friend, Judy Luna-Marcelo, who understands, recognizes and loves the Marya in my soul. I praise and thank God for the Sigma Delta Phi Sorority for their trust, for friendships made and promises kept. And I praise and thank God for UP Los Banos for helping raise and promote a society whose ideal of service is that which is pursued through excellence. May God bless the Rose of Marya and may everyone who look at her be constantly reminded to live the purpose for which she was created. Today, I behold God's creation through my hands and my heart is full.